Big-hearted students at Somersfield Academy are dedicating their annual Community and Service Day on June 24 to raising money for the St. Baldrick’s Foundation for childhood cancer research. Fourteen students, teachers and parents have volunteered to have their heads shaved during that morning’s school assembly as a mark of solidarity with cancer sufferers who suffer hair loss as a result of chemotherapy treatment. During the day, 130 Middle Year students will take part in a three-mile Walk-A-Thon and more than 40 students will team up with the Bermuda Cancer and Health Centre to distribute UV bracelets throughout the community as part of the Centre’s SunSmart skin cancer awareness programme, funded by the St. Baldrick’s Foundation. Somersfield teachers Brice Pursell and Lee-Anne Cox with some of the student shavees. From left: Michael Costello, Matthew Elliott, Kairo Morton, Nicholas Kempe and Daniel Larson. Not to be outdone, the school’s Children’s House students [aged 3-6] are raising funds by doing chores at home for $1.00 a job. They will also be doing a Trash-A-Thon with Keep Bermuda Beautiful making a donation to St. Baldrick’s for every bag of trash collected. Students have already raised money through ice cream sales at the school and will be holding a Wacky Hair Day on the last day of term with students donating $2.00 to come to school in crazy hairstyles, colours or wigs. More than $15,000 has already been pledged for the shaving event alone. Although Bermuda’s main St. Baldrick’s events were staged in March, Lead Organiser Tracey Gibbons said the charity welcomed contributions at any time. Mrs. Gibbons, a Somersfield parent and Senior Vice-President with Allied World Reinsurance, will herself be among those getting shaved for a good cause and is even having her hair dyed green and blue – Somersfield’s school colours – for the occasion. Her son Toby, aged 11, is also being shaved. Shaving and hair-colouring services are being donated by the TK Hair Creative Team, [Tanju and Traci], and Tony at Bang Bang Hair. Since 2005, the St. Baldrick’s Foundation has funded more than $127 million in research grants to find a cure for childhood cancers. Worldwide, a child is diagnosed with cancer every three minutes and more children are lost to cancer than any other disease. Fifty years ago, almost all kids diagnosed with cancer died but because of research, today about 85% of children with the most common type of cancer [acute lymphoblastic leukemia] will live. 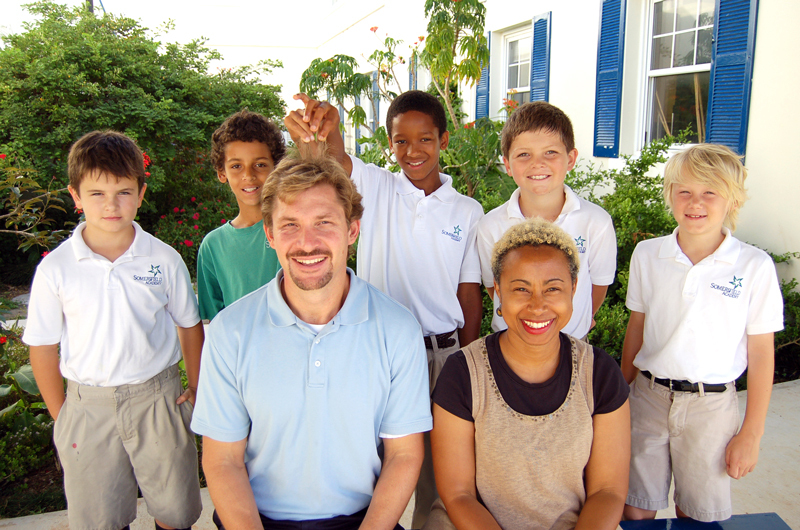 To sponsor the Somersfield Academy team or an individual visit here, and for all our coverage of St. Baldrick’s in Bermuda click here.